SNITZEL (AUS) (Bay 2002-Stud 2006). 7 wins-4 at 2, MRC Oakleigh P., Gr.1. Champion Aust. Sire twice. 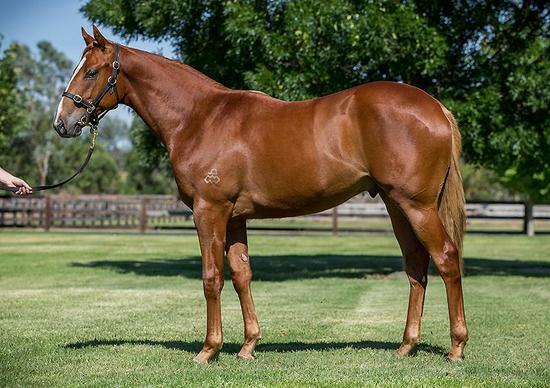 Sire of 926 rnrs, 680 wnrs, 86 SW, inc. Trapeze Artist (ATC TJ Smith S., Gr.1), Shamus Award, Estijaab, Redzel, Summer Passage, Invader, Russian Revolution, Hot Snitzel, Sweet Idea, Sizzling, Snitzerland, Wandjina, Heavenly Blue, I Am Excited, Spill the Beans, Menari, Showtime, Snitty Kitty, Thronum, French Emotion, Time for War, etc. Happy Tour (g. by Snitzel). 2 wins at 1200m in 2018-19, HKJC Middle H., Tak Wah H., 3d HKJC Panasonic Air Conditioner H.
Super (g. by Snitzel). Winner. See below. Hot Hussler (f. by Smart Missile). Winner at 1200m in 2017-18 in Aust. Tosen Chris. 4 wins to 1400m in Japan. SATURDAY FEVER (Groom Dancer). 7 wins-2 at 2-from 1050m to 2400m, A$304,920, STC NE Manion Cup, Gr.3, SAJC Alcohol Go-Easy S., L, Magic Millions H., VRC Think Big H., SAJC Jayco Summer of Speed H., Legacy South Australian Olive Oil H., 2d TTC Launceston Cup, Gr.3, MRC Master Avenel H., SAJC Glenrae Stud Danetop H., Carlton Draught H., 3d AJC Chairman's H., Gr.2, STC Canterbury Cup, Gr.3, SAJC Sires' Produce S., Gr.3, TTC Launceston Cup, Gr.3, SAJC Oaklands P., L, 4th SAJC Adelaide Guineas, Gr.3, Rain Lover P., Gr.3. Friday Flight. 5 wins from 1400m to 1700m, Tokyo Kumpu S.
Floral Nirvana. 4 wins from 1400m to 2200m, NZ$6,200, HK$2,773,300 in NZ and HK, HKJC Tokyo H., Po Toi H., Wind Dancer H., 2d HKJC Community Chest Cup, Chevalier Construction H., Japan Racing Association Trophy, 3d HKJC Fan Kam H., Philips H., Jebsen Fine Wines H., Charming City H., American Club Challenge Cup H., Gallop H., Hong Kong Golf Club Centenary Cup. At the Weekend (Hussonet). 5 wins from 1350m to 1600m, A$76,625, TRC Schweppes H., Blarney Castle H., TTC Mark Media H., 2d Tasmanian One Thousand Guineas, TTC Coates Hire P., 3d Tasmanian Oaks, L.
Race Record: 5 Starts 1-1-0 A$17,850. Winner at 1400m in 2018-19, 2d SAJC AAMI H.